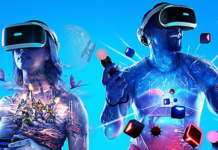 SuperData: Oculus Quest will Boost in 2019 VR Market? 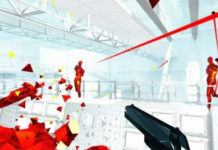 Home News Oculus Quest will Boost in 2019 VR Market? 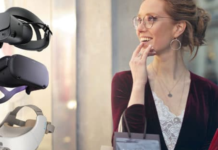 The company SuperData has just published the figures for sales, significantly higher, virtual reality headsets in 2018 and presents a projection for the year 2019. 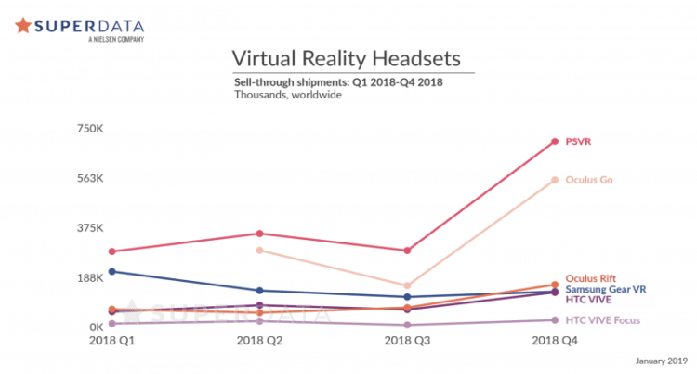 After a half-year 2017, sales of virtual reality equipment jumped in 2018 and exceeded expectations. 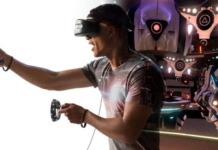 This is apparent from the study published by the firm specializing in market analysis of video games, consoles and virtual reality equipment, SuperData Research. The US firm has also split a projection for the year 2019 promising a nice success to the future Oculus high-end standalone headset, the Quest. According to the firm, the PlayStation VR headset sold best in 2018. It is hot on the heels, since its release, by Oculus Go marketed at the beginning of the second quarter. The Samsung Gear VR, which sold very well last year and in 2016, has stalled and experienced declining sales throughout the year. The Oculus Rift and the HTC Vive continue to battle while the Vive Focus is struggling to find its audience. The firm states that sales revenue grew + 30% compared to 2017. Particularly interesting growth, especially as prices have fallen steadily over the course of the year. The fourth quarter is, unsurprisingly, the month with the most sales. Between Black Friday promotions and Christmas shopping, the last quarter is still conducive to these sales. 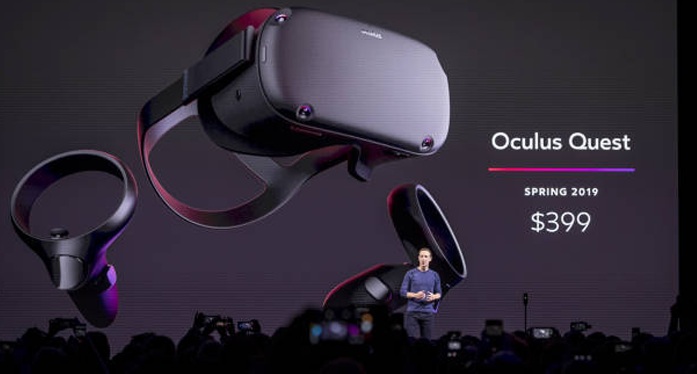 For the year 2019, SuperData predicts that the Oculus Quest headset will be a big hit estimating sales to 1.3 million units for the future headset of Facebook’s subsidiary. This important interest is due to the appeal of VR but at affordable rates while offering high-end experiences. 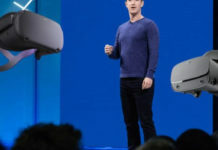 The autonomy offered by the Quest is also a huge advantage over the Oculus Rift which requires not only to be connected by cables but also to have a powerful PC. 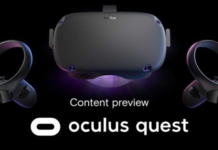 The release of the Oculus Quest is particularly expected. Note that the Oculus standalone headset could be a big blow to HTC. The Korean manufacturer, which is not very successful with its Vive Focus headset, should adopt a different strategy at Oculus this year. Headset sales are obviously an important factor, but it is the sales of games that generate the biggest revenue. 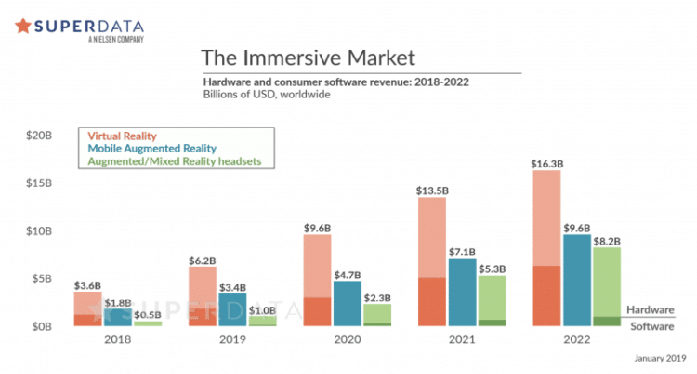 Launching into the game of predictions, Superdata has delivered its estimates for the next 3 years on virtual reality, augmented reality on smartphones and mixed reality headsets. Still marginal in 2018, the mixed-reality headsets, such as the Magic Leap One, are expected to show a nice growth gradually catching up with that of virtual reality. Previous articleAce Combat 7 VR: The New PSVR Bomb Available on PC in 2020? Spot on with this write-up, I actually think this site needs a great deal more attention. I’ll probably be back again to read more, thanks for the information!